Not many people accidentally stumble into Why Cycles, as you have to successfully navigate the Dolores Way commercial maze in order to find its 2605 address. But those who do are rewarded with offerings of a libation from the coffee bar (which, in addition to a sleek espresso machine, features a full lineup of bottles from Marble Distilling and a fridge stocked with beer and San Pellegrino) — and those who give some notice of their arrival can demo a bike. Founder Adam Miller is particularly proud of what he and his four Why Cycles colleagues have done with the place. “We made this all from scrap, so it was super dirt cheap. That’s how we got this fancy marble,” he said of the bar. “We just got these cubicle walls,” he laughed. It’s the newest space for the company, which only just hosted its official grand opening in June — a full four months after actually moving in. Keeping up with operations during peak biking season meant things like grand openings had to wait. “We started in this spot February 1, and February is also the time that bike season starts up, so we were moving in here at the same time that sales were ramping up. We were pretty busy,” he said, mentioning that the company ships to 14 countries in branded travel bags in lieu of disposable packaging. It’s not even the first Dolores Way address for Why Cycles. That was in December, when the Why Cycles crew first settled into Carbondale from Ogden, Utah. “We’re really new,” he said. While that may be true regarding this particular brand in this particular location, that’s certainly not the case in terms of the team’s experience in the industry. Miller, 26, started dabbling in the bike business when we was a 14-year-old Alaskan. Because of Alaska’s climate, fat bikes — “a bike with a big, fat tire on it,” as Miller described them — are incredibly popular there, as the wider tires allow more stability on snow and ice. When Miller moved to Colorado to pursue his economics degree at Colorado College, enthusiasm for fat bikes was pretty much contained in his home state, he explained. That led to a lucrative opportunity: nobody else was selling high-end fat bikes. “They were all cheap and heavy, and I saw an opening in the market,” he said matter-of-factly. He co-founded Borealis Fat Bikes with a guest professor who funded the venture during his junior year at CC. In 2015, Miller decided to sell his 50-percent stake to his business partner, citing differences in visions. That transaction subsequently allowed him to start Why Cycles, which focuses on high-end titanium bikes. It’s an aptly named company, as there’s a reason for every aspect of his most recent venture. “We all like riding bikes, so we just want to keep making bikes that we want to ride. It happens that other people want to ride them, too,” Miller said. It’s one of several reasons behind Why Cycles’ relocation to Carbondale and Dolores Way in particular. 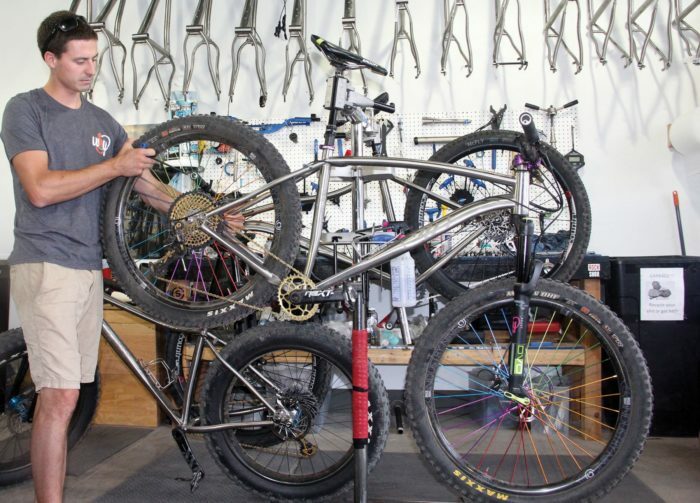 Miller is excited to further ingratiate his company into the local scene — Aloha Bikes, 580 Hwy 133, is a retailer — but the majority of sales are online. “We’re set up so people can walk in, but we’re not like a retail shop, so we didn’t need to be on Main Street,” Miller said, adding that rent for commercial space on Dolores Way was much more practical. Additionally, Carbondale’s proximity to I-70 meant that shipping costs here wouldn’t be any more expensive than if the company was headquartered in the Front Range — and he would much prefer to be here. “From our office, we have to go on pavement for like a quarter mile and then we’re out on trail, and that’s mindblowing,” he said, naming Red Hill his “by far” favorite trail here. That combination of business practicality and lifestyle quality is the main reason behind Why Cycles opting to call Carbondale home.